Shamrock FC will mark its fourth trip to Kansas City this year on July 7. SFC 291 will have a lot to live up to following up on the show Bobby Voelker and Zak Bucia put on this past May. While Bucia got his arm raised on the night, the real winners were the fans who packed the Ameristar Casino making for a loud and energetic audience. SFC 291's main event will feature Deron Carlis taking on Adam Stickley. After a red-hot 4-0 start to his pro career, Carlis hit a bit of a skid losing his last three. He'll be hungry for victory when he steps into the cage against the Caveman Crew's Stickley. Fighting out of Independence, Stickley has also been on a bit of a losing streak and this will be only his third fight in four years. Despite the skid, don't count out Stickley who's faced some of the area's best like Kevin Croom, UFC Featherweight Alex White, and the 11-1 Grant Dawson, who could be a safe bet for a UFC fight within the year. Heavy handed Calen Born returns to Ameristar after his big win in March to take on the "Sharknado" Gary Westphal, who was also victorious in his last trip to the KC casino. Born made quite a splash at SFC 285 with a 32-second KO in his professional debut. Born's big and throws bombs, but will face a resilient Westphal out of Kansas who can be sneaky with his submissions. If Born over-commits on the ground, he could be in trouble with the "Sharknado". Full of confidence thanks to a three-fight win streak, Anthony Goldfield will be making his professional debut when he takes on Charlie Bottom at welterweight. Goldfield, while not as tall as some 170-pound fighters, is a physical force inside the cage. He likes to stand and trade, and thanks to many years on that mat in high school wrestling, is hard to take down. At 6-foot-2, Bottom will have quite a bit of reach advantage on Goldfield who clocks in at 5 foot 8. Bottom will want to use his reach to keep Goldfield on the outside and try and piece him apart with the jab. If Goldfield gets inside, he could find himself coming out on top. The always-dangerous Raul Romero will face Matt Murray in what could be a fight of the night should these two decide to keep the fight standing. Murray has notched a few wins by submission, and Romero will want to avoid falling into his guard. Former Mizzou wrestler Johnny Eblen will kick things off on the pro card taking on Garrett Nigles. Eblen posted a 87-24 career record while on the Tigers wrestling team. Since graduating from the University of Missouri in 2015, Eblen has relocated to Boca Raton to join the American Top Team. One of the highlights of the undercard is the return of Alan Vasquez. Vasquez's - who will take on Edmund Coler - last fight in March went super-viral on the internet when the match nearly ended in a double KO. Vasquez and opponent Axel Cavares both landed KO-worthy punches, connecting at the same moment sending both men to the canvas, but it was Vasquez who the first one up, thus declared the winner. A middleweight match-up featuring Nikolas Folken and Darian Weeks is also one fight to watch. Weeks could be the next big breakout talent out of Missouri, recently winning his bracket in a three-night middleweight tournament to improve his record to 7-1. 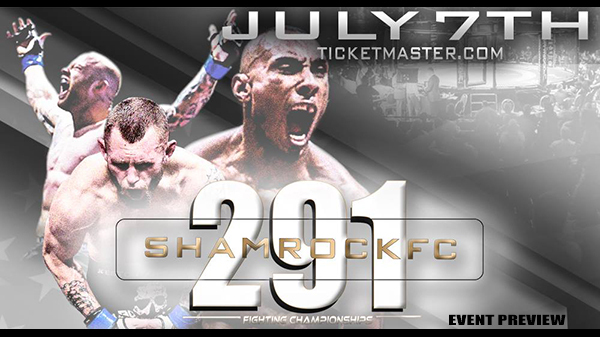 Tickets for Shamrock FC 291 are available from the Shamrock FC store and Ticketmaster.com. The event will be televised on internet PPV.